Never waste expensive canned food leftovers again. 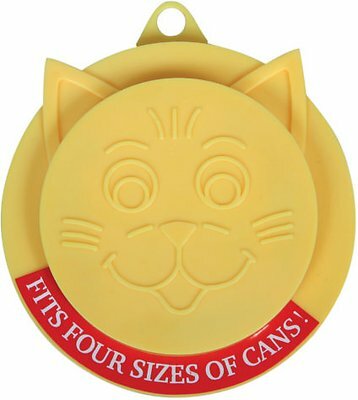 The Kitty-Kap Top can cover is a colorful and durable plastic lid designed to keep food remaining in opened cans fresh for your pets next meal. Colors vary (yellow or orange)- color ships at random! It does fit multiple sizes. The plus for me is that it doesn’t break all my nails when I try to remove it from the 3oz cans like the ones made for just that size. This hangs over the edges enough for easy removal. I don’t use the larger cans, but I suspect the ears would help to remove it as well. This cap seals the 5.5oz Hill's urinary hairball control cans well, which is the outermost circle. But the innermost circle is slightly smaller than the 2.9oz Hill's c/d cans, making it very hard to put on to or get the cover off from the can. I didn't try the middle size two circles as I don't have other cans. I feed one of my cats soft food with her hard food and separate the can put into fours. I use to use foil until I found these lids. The lids fit all sizes of cans and fit each snuggly. There were no leaks when it dropped from the fridge and the lid stayed in place. I would definitely recommend this lid. Bought this product since my cat only eats 1/2 a can at each feeding. However, I was rather surprised I actually buy a canned product that is a little smaller than the smallest seal. I still use it, because it is nicer that just wrapping it in plastic bag. Petmate kitty kaps are the only caps I’ll use to keep my refridgerated wet food fresh. The plastic is of high quality, durable, fits four can sizes tightly, and is stiff enough not to leak any air. Easy to wash and care for. Long lasting! Great value. Even fits the tiny Fancy Feast cans! When I first saw this, I thought it would fit the bigger cans but not the small one that I could never find a lid for. This one actually fits. It's versatile and fits a variety of cans. It's also cute! I waited way too long to order this! We've got 2 dogs and 1 cat. Usually the cat's canned food doesn't need to be refrigerated, unless of course we get the larger 5.5 ounce cans. The 2 dogs just recently ended up needing different wet foods, so we've got 2 separate cans to refrigerate there also. I finally gave in and bought this cover to make life easier, but I regrettably only bought 1. It works perfectly and I will be buying more soon! Does the job but hard to take off the can. Works well especially for refrigerating my wet food once a can is opened. However, sometimes I struggle to open it. I recently broke part of it after trying to open it with so much force. Super cute, works great! It’s so nice to just pop a lid on the can and throw it back in the frig. Love that it fits different sizes of cans!